This was my second attempt baking this combination. The first time, for Christmas, I created an enormous cake that included a full recipe of cheesecake layered in between two regular-sized red velvet cakes. It was a major dessert, but it was honestly too much. So, when my brother-in-law requested this dessert for his birthday, I wanted to bake a scaled-down version while also trying out a new red velvet cake recipe. I really like the new red velvet cake recipe. The texture was very soft with a nice crumb. The taste seemed to be complex with a number of different flavors coming through. Plus, the color was a nice red that really popped versus the all-white exterior once I started cutting pieces. I used a half recipe of my cheesecake and scaled down the amount of icing that I would usually use for a two-layer, 9″ cake (since I didn’t really need to put a ton of icing between layers here). I also scaled the cake recipe by a third and split the batter between 2 9″ pans instead of using 8″ pans as the recipe does. This way, I ended up with red velvet and cheesecake layers that were all approximately 1″ tall, with thin layers of frosting between layers (to hold it together) and a thicker frosting to cover the whole cake. I topped it off with some white chocolate shavings to make it prettier, and this cake ended up being one of the best decorated cakes I’ve ever done on my own. For the cheesecake: Heat oven to 350 degrees. Wrap inside/bottom of a 9″ springform pan with aluminum foil (this will make transport easier after baking). Butter the springform pan and foil. Wrap bottom and sides of the springform pan with aluminum foil, and place it onto a baking sheet with 1″ raised edges. In Cuisinart food processor, beat softened cream cheese, sugar, and heavy cream until smooth (maybe :30 to 1:00 or less). Add vanilla and ricotta, and mix until incorporated. Add eggs one at a time and blend just enough to fully incorporate the eggs. Pour into prepared springform pan. Pour cheesecake mixture into springform pan. Place on a rack in the middle of the oven, and pour boiling water onto the baking sheet approximately 0.5-1″ up sides of springform pan. Once chilled, run a metal knife/spatula along the side of the cheesecake to loosen. For the cake: While cheesecake is in the oven prepare the cake. Butter and flour two 9″ cake pans. Beat butter, oil, and sugar on medium-high speed for approximately three minutes, then add eggs and beat until just incorporated. In a separate bowl, combine buttermilk, sour cream, vinegar, and vanilla, whisking to combine. Set aside. In another bowl, sift all-purpose flour, cake flour, and cocoa powder. Whisk in salt and baking soda. Add half of the dry mixture to the butter mixture in the stand mixer. Stir on low until incorporated, then add remaining dry mixture and repeat. Add half of the wet mixture to the stand mixer, stir on low, then repeat with remaining wet mixture. Scrape sides of the bowl and add red food coloring. Mix for 30 seconds for smooth batter. Split batter evenly between the two cake pans. Once the cheesecake is finished baking, bake the cakes at 350 degrees for 20-25 minutes, or until toothpick inserted into the center comes out clean. Cool cakes for 10 minutes in the pans, then remove, wrap each layer in plastic wrap, and refrigerate with cheesecake overnight. For assembly: Level both red velvet cake layers, reserving the tops in a medium-sized bowl to create a crumb topping later (if desired…I used cake strips instead). Run a knife along the side of the cheesecake to loosen, and remove the side of the springform pan. 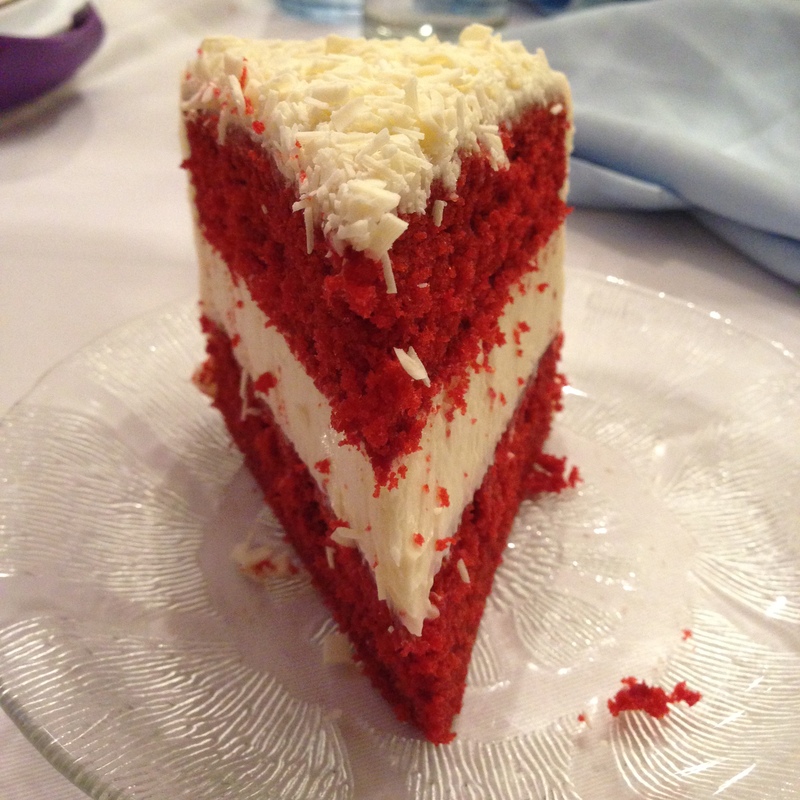 Apply a smooth layer of cream cheese frosting to a layer of red velvet cake. Place frosting side down onto the cheesecake layer, then flip the cake onto the other hand to remove the pan and aluminum foil for the bottom of the cheesecake. Apply a smooth layer of the frosting to the other cake, then place frosting side down on top of cheesecake. Gently apply a thin layer around the entire cake, then chill in refrigerator for 15 minutes to harden. Frost the cake with the remaining icing and decorate the cake as desired (I shaved white chocolate on the top).